also reachable within 2.5 hours from Nagoya area by cars. From November 3,　our fruit picking will be moved to Farm 1. When you come over to our farm by car, please do NOT put our phone number into car navigation system (GPS). Many customers have got lost so far because they put our home phone number. Please use our home address, instead. It is 2281-1 Iinoh, Minami Alps City, Yamanashi Prefecture 400-0222(Zip-code), Japan. Please click here to see our original map page. * If you can bring international driver's licence and rent a car, I believe that is the best way for you to travel around since there are many nice spots to visit in Yamanashi. Also, if you have time, I suggest you to stay at least one night here in Yamanashi. There are lots of nice inns with reasonable fare. Many of them have Onsen, natural hot spring facilities. If you want me to make a reservation, please write to me. I'm willing to help you. On Chuo Highway, in either case when you are from Tokyo or Nagoya direction, you will see the sign telling you about Minami Alps(南アルプス方面) ahead of you, then please get off the Chuo Highway and follow this direction at Futaba Junction(双葉ジャンクション) and go for another highway called Chubu Oodan Road(中部横断道路). After your switching to Chubu Oodan Road, you will see the first exit called Shirane IC (Shirane Interchange白根インター) soon. under the highway.) Please go through this light and move on until the next light. On the next light, you will see a pretty attractive sign of photo studio on your left hand. At this light, please turn right. At the fourth light, you will see the sign with the words of "Iino Shinmachi 飯野新町" in both Japanese and English. Please turn left at this light. 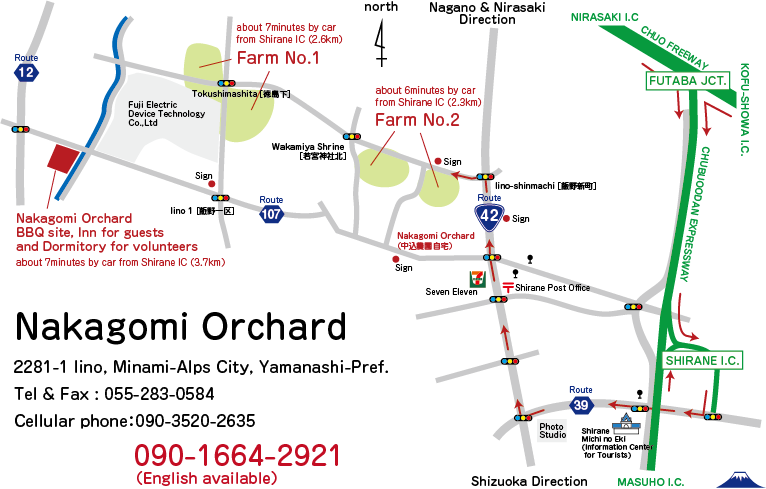 After that, please go forward for about 400 meters, and you will see the entrance sign of Farm 2 of Nakagomi Orchard on your left hand. In order to get to our Farm 1, please just keep going straight until you meet with two more　traffic lights. Our Farm 2 will be around that light. we will put out our reception with tents for our customers whenever we are in season for fruit picking. Since many customers from overseas ask me how to get to our farm from Lake Kawaguchiko(河口湖 one of five lakes) near Mt. Fuji, I'm putting the following information. * If you are coming by car, it takes only an hour. (1) First, you take Highway at Kawaguchiko(河口湖) IC and go all the way to Ohtsuki(大月)JCT. Then, go forward to Kofu (甲府) direction all the way to Futaba (双葉)JCT and go foward to Minami Alps direction. At the first IC called Shirane (白根) IC, you can get off. After Shirane IC, please follow another detailed map. From Shirane IC, it takes only 3 min. to our farm. *Please remember that two of the gas stations on the map are both disappeared. *Also, the pink color bridge was taken away in January 2014.
from Lake Kawaguchiko area. You have to take Fuji-Subaru Line that is toll road all the way to the 5th step. Or if you are going by bus, you can catch Fujikyuko bus at Lake Kawaguchiko station area, I believe. How to get to our farm From Lake Kawaguchi of Mt.Fuji area by public transportation. If you are willing to come here through FUTABA JUNCTION & SHIRANE INTERCHANGE, please visit another page where we have prepared a new English map for you. ＊As long as you are visiting us via the Chuo expressway, I would strongly advise you to come through Futaba Junction and & Shirane Exit. You will find that this way will be a lot easier than coming through Kofu-Showa or Nirasaki Exit.